President Barack Obama has appointed a 34 year old Nigerian, Adewale ‘Wally’ Adeyemo who served in top roles at the Treasury Department to succeed Caroline Atkinson as his deputy national security adviser for international economic affairs. 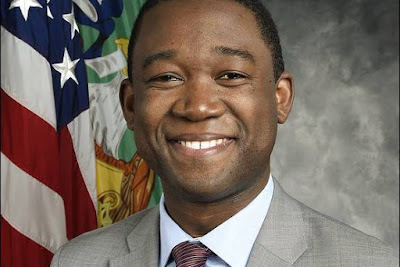 Adeyemo has served in Obama’s administration since 2009. He joined the White House’s National Economic Council as deputy director. He was the Treasury’s lead negotiator on the currency agreement that was part of the Pacific trade deal. According to President Obama, “For the past four years, I have relied on Caroline Atkinson, most recently as my Deputy National Security Advisor for International Economics, as we’ve navigated pressing challenges to the global economy. “As my representative at the G-7 and G-20, she played a key role in coordinating our response to international financial crises, worked with our allies to devise and implement targeted economic sanctions to advance our national security goals, played a vital role in our economic engagements with China, and helped to achieve breakthrough agreements on climate that will strengthen our economy and our security. “I’ve relied on, and benefited from, Caroline’s knowledge and judgment and, as she concludes her tenure on my national security team, I am deeply appreciative of her service. “I am grateful that Caroline’s work will be carried on by Adewale “Wally” Adeyemo, who has served in my administration since 2009. At the Treasury Department, he was part of the team that helped coordinate our response to the global recession, laying the foundation for renewed growth at home and abroad. Adeyemo holds a B.A. from the University of California, Berkeley and another degree from Yale Law School.